When you go to a larger FPV racing event, it’s not uncommon for event organizers to require that you use their FPV and IR transponder gear instead of their own. This makes sense for a number of reasons (organizational simplicity, assurance that everyone is running the same equipment, etc), but it generally just differs complexity to the pilots, rather than the event organizers. I’m okay with this, since the event organizers have a monolith of a job ahead of them. However, it’s good to know for the pilots to know ahead of time so that they can make some preparations. 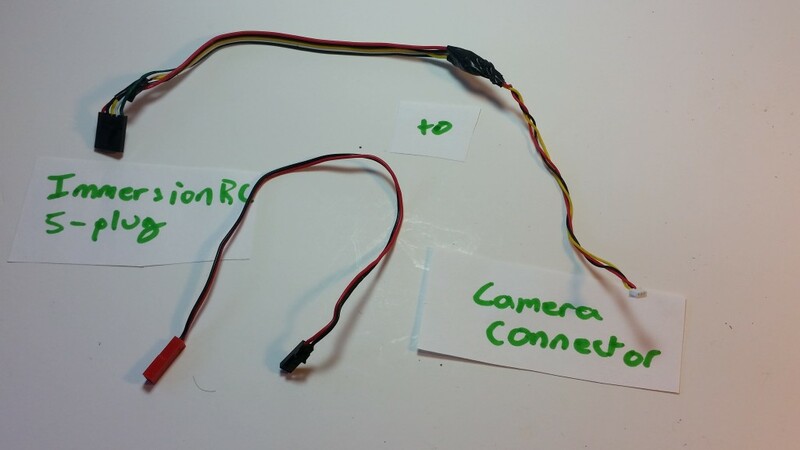 ImmersionRC VTX (25-200mw) — this is a general assumption, but if a race is big enough, they are most likely going Immersion gear. As we continue to move forward, they are going to be putting more and more people on “race band”, which is also antenna dependent, so they should also be providing an antenna. The first thing I did was solder a Male JST connector on to a 5-22v rail somewhere on my quad. In my case, I soldered it straight on to an auxiliary output from my power distribution board. I could have also soldered straight on to an ESC connection or something, but this was a convenient spot for my build. See the male JST connector wired straight into PDB, and the Immersion RC 5-plug soldered to the camera connector. The VTX will provide power to my camera via this cable, and take the video signal from the camera back to the VTX to be transmitted to my goggles. The power line just plugs straight into the VTX. Next, I created a wire to connect my VTX to my camera. The event that I was at (F3 Expo in Atlanta, GA) provided these ImmersionRC 5-plug cables and power leads that I was able to keep. You may have to buy one, but I think having one ahead of time and being prepared will be more worth it than trying to do all this surgery in the field. On the 5-wire cable, I simply took a 3-wire Camera cable that plugs into my HS1177 camera and soldered it directly to the corresponding lines — power (5v), ground, and signal (red, black, yellow, respectively). Powering your camera this way provides filtered, regulated 5 volt straight to the camera for perfect, crystal clear video. Then, I can take the power cable, which has a female JST lead on it, plug it into the male JST lead that I’ve already soldered onto the power distribution board, and just plug it all in. One of the reasons I like this solution a lot is because it’s also backwards compatible with my own gear, not requiring any further soldering. 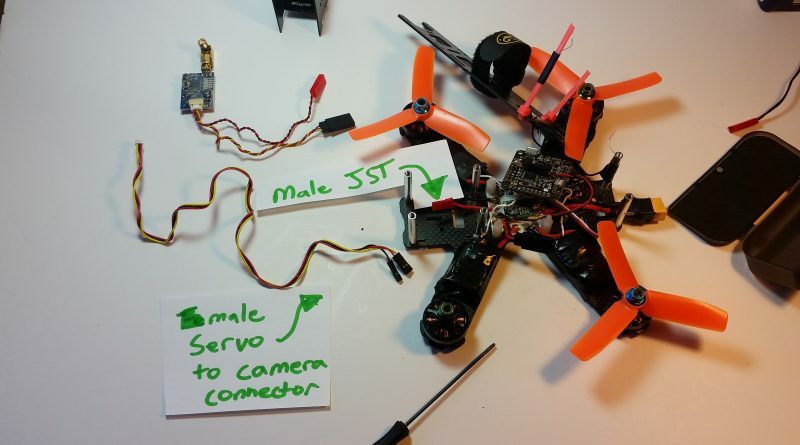 For my own gear, I can still connect my FX799T VTX using the male JST connector, and I use a male-female servo connector for my camera power. 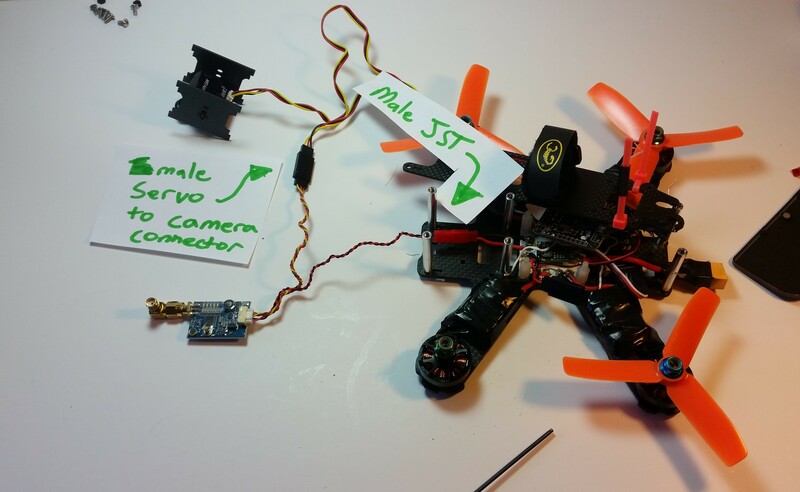 I could shorten it down a little bit, but I like having the solder-less video system for simplicity, since the vast majority of my quadcopter problems are with video. And now the final piece of the puzzle — the IR transponder. This piece of electronics simply requires 5v power and a ground connection to run it, and it comes pre-installed with a 3-prong servo connector already hooked up. 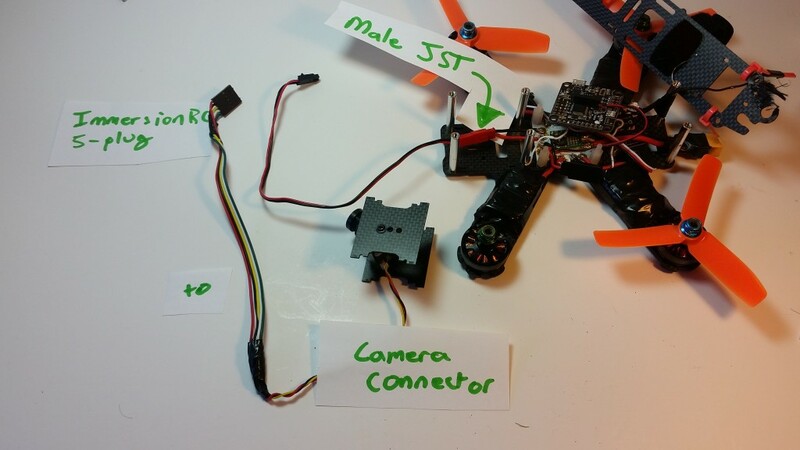 To set this up, what I did was connect a female servo lead to the 5v output directly on the Polulu that powers my flight controller. This female servo lead extends out the left side of the craft, so I can quickly plug in the IR transponder male servo lead and give it power. I mount all of the stuff on top of the quad with battery straps and orient in the ways that are requested by event organizers. It’s not pretty, but for a day of racing it will get the job done.